The epidemic of chronic diseases, a better understanding of the underlying mechanisms and causes as well as technological advancements are transforming medicine from a reactive to a pro-active and preventive discipline. Modern biology and medicine provides deeper insights into disease mechanisms, makes blood a diagnostic window for viewing health and disease for the individual and generates metrics for assessing wellness. P4 is an approach to make medicine more Predictive, Preventive, Personalised and Participatory. Its two major objectives are to quantify wellness and predict and prevent disease. P4 medicine aims to be able to detect and treat perturbations in healthy individuals long before disease symptoms appear, thus optimizing the wellness of individuals and avoiding disease. P4 medicine represents a move away from models of reacting to illness to maintaining health across the lifespan. Many academic institutions and experts see P4 medicine as an important area for research and development, and have identified positive steps and barriers to progress in this area. Moving to a P4 model will involve patients and stakeholders from across the healthcare sector working together. P4 medicine aims to 1) improve health care, 2) reduce the cost of health care, and 3) stimulate innovation and new company creation. Health care is not the only subject that can benefit from such integrative, cross-disciplinary, and systems-driven platforms and cultures. Many other challenges affecting the modern world, such as energy, environment, nutrition, and agriculture can be transformed by using such an integrated and systems-driven approach. 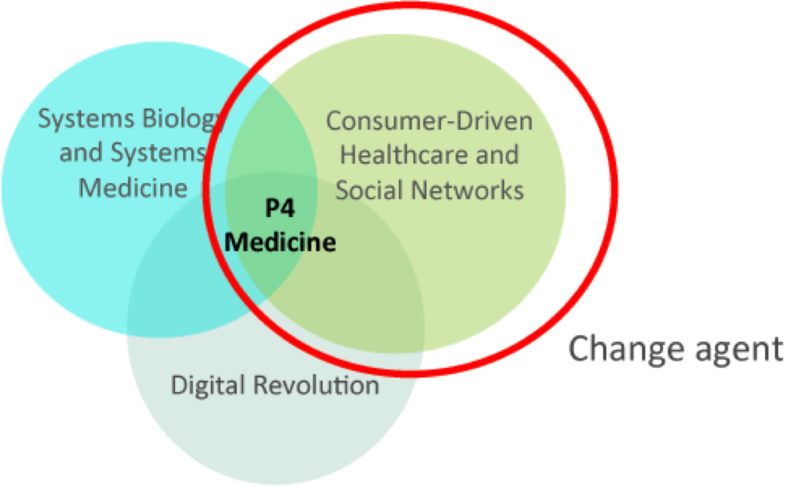 P4 medicine is the convergence of systems medicine, digital technologies and consumer-driven healthcare. P4 medicine aims to revolutionize the practice of healthcare in the coming decades. Today, medicine is largely reactive. It waits until a person is sick and then treats a disease, with varying levels of success. The revolution will emerge from the convergence of systems biology and the digital revolution’s ability to create consumer devices, generate and analyze “big data” sets and deploy this information through business and social networks. Biology is a complex system. P4 medicine, along with systems biology, has forced researchers to collaborate in new unprecedented ways to develop the appropriate tools to deal with the complexities of biology and disease. The key is to attack the ―big science problem‖ of health care with a systemsdriven, integrative, cross-disciplinary, and milestone-driven ISB-like platform and culture. Small science, individual investigators, and their laboratories will play an important role in deciphering the complex details of the broad pictures that are painted by systems biology and systems medicine. The ultimate objectives of P4 medicine are simple: 1) improve health care, 2) reduce the cost of health care, and 3) stimulate innovation and new company creation. However, biology and medicine are not the only complex systems problems that society is struggling with. All the major problems in society, for example health care, energy, environment, nutrition, and agriculture, are susceptible to the same kind of integrative systems approach which has been presented here. Therefore, institutions that create an appropriate systems-driven, cross-disciplinary, integrative, and milestone-driven environment for researching complex or big science problems will be uniquely positioned to transform and revolutionize the deciphering of many of society’s current challenges. The question of how academic, industrial, and governmental institutions will accept, build, and deploy these systems-driven and cross-disciplinary infrastructures is a fascinating one. Medicine will move from a reactive to a proactive discipline over the next decade—a discipline that is predictive, personalized, preventive and participatory (P4). P4 medicine will be fueled by systems approaches to disease, emerging technologies and analytical tools. There will be two major challenges to achieving P4 medicine—technical and societal barriers—and the societal barriers will prove the most challenging. How do we bring patients, physicians and members of the health-care community into alignment with the enormous opportunities of P4 medicine? In part, this will be done by the creation of new types of strategic partnerships—between patients, large clinical centers, consortia of clinical centers and patient-advocate groups. For some clinical trials it will necessary to recruit very large numbers of patients—and one powerful approach to this challenge is the crowd-sourced recruitment of patients by bringing large clinical centers together with patient-advocate groups. Medicine has always focused on treating disease after it occurs, with both treatment and diagnosis based largely on population averages, and patient decisions confined to choices among alternatives provided by their physicians. The European Society of Preventive Medicine supports the development of P4 Medicine by bringing together an exploratory community of scientists, physicians and other health care professionals, and people – both healthy and sick – who want to benefit themselves, their families, and their community. This community will come together in different projects which ESPREVMED is working to launch in the relatively near future. The convergence of systems biology, the digital revolution and consumer-driven healthcare is transforming medicine from its current reactive mode, which is focused on treating disease, to a P4 Medicine mode, which is medicine that is predictive, preventive, personalized and participatory. Big data tracking multiple dimensions of individual health + ongoing systems analytics = personalized, actionable health information. Personalized data will be de-identified and aggregated to provide further insight into both health and disease which will yield more productive personalized actionable information. P4 Medicine aims to improve the quality of care delivered to patients through better diagnoses and targeted therapies. These advances facilitate new forms of active participation by patients and consumers in the collection of personal health data that will accelerate discovery science. Soon a virtual data cloud of billions of health-relevant data points will surround each individual. Through P4 Medicine, there will be an opportunity to reduce this complex data to simple hypotheses about how to optimize wellness and minimize disease for each individual. In the middle of the last century, medical science began to understand the links between metabolism, aging damage, and age-related disease and disability: that the side-effects of metabolic processes ongoingly add to the burden of cellular and molecular damage in our tissues, and that this damage drives the diseases and disabilities of aging. So medicine became focused on developing drugs that would “manage” the so-called “risk factors” for age-related diseases, pushing the body to produce less of the metabolic precursors of some particular kind of cellular or molecular damage in the body. By doing so, these drugs would slow the accumulation of damage in a vulnerable tissue, and thus bend the curve of a particular age-related disease. Scientific developments in the last few decades have laid the foundation for a new class of medicines: rejuvenation biotechnologies. Rejuvenation biotechnologies are targeted therapies that apply the principles of regenerative medicine across the entire scope of the damage of aging. In other words, instead of merely slowing down the accumulation of aging damage in our tissues, rejuvenation biotechnologies will remove, repair, or replace the damaged cellular and molecular machinery. This means that with every round of therapy, a person’s eyes, hearts, arteries, and bones will not just suffer less ongoing degradation of their structures, but will actually become more youthful and healthy in their structure and function, as the fine cellular and molecular order of these and other tissues are progressively restored to their youthful integrity. Today research efforts are accelerating the transition of medical science from risk factor management to regenerative medicine-based solutions to the diseases and disabilities of ageing.